The most comprehensive solution to protecting your marine investment. Blocking harmful UV light, and sheltering from wind and rain are just several of the practical benefits of owning a NICCUM Boathouse. 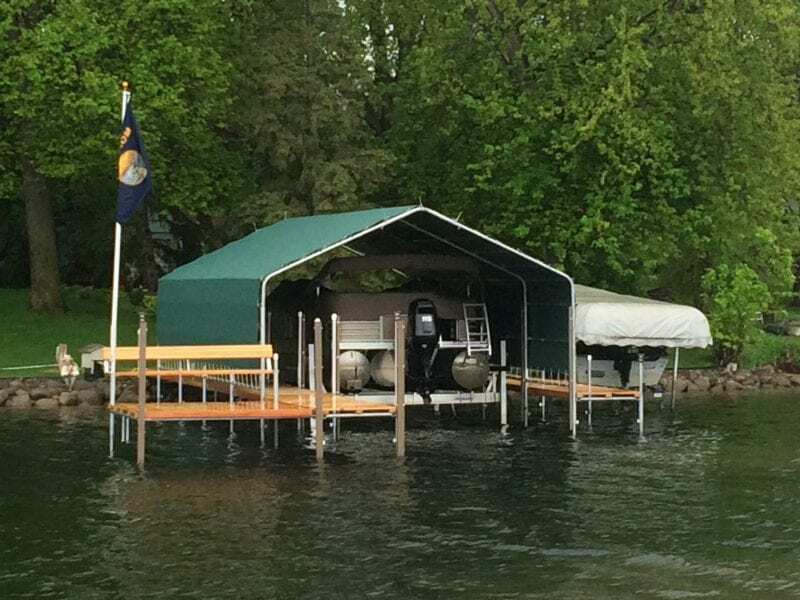 NICCUM Boathouses, like all of our dock systems, are manufactured using custom milled, high carbon steel tubing, extra deep custom milled set screws, with all parts professionally welded and “hot dipped galvanized” to provide years of corrosion-free service. 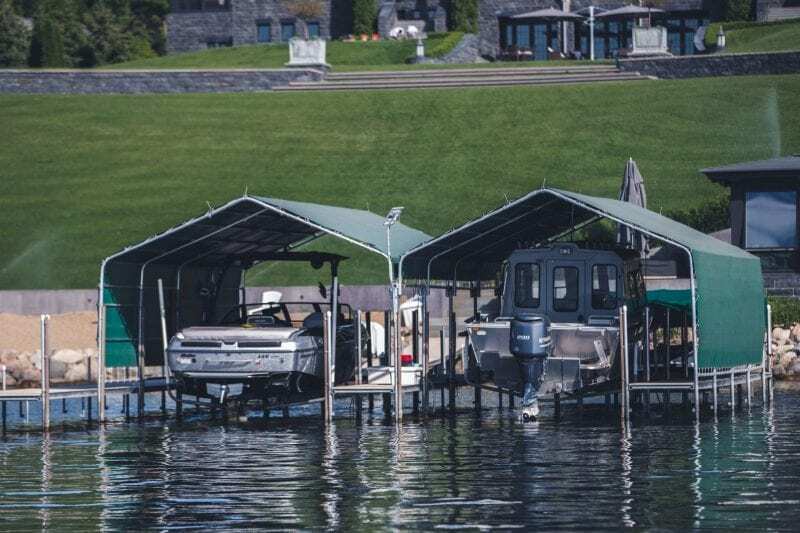 NICCUM Boathouses use all galvanized steel framework for both the primary support arches and vinyl support bridging. 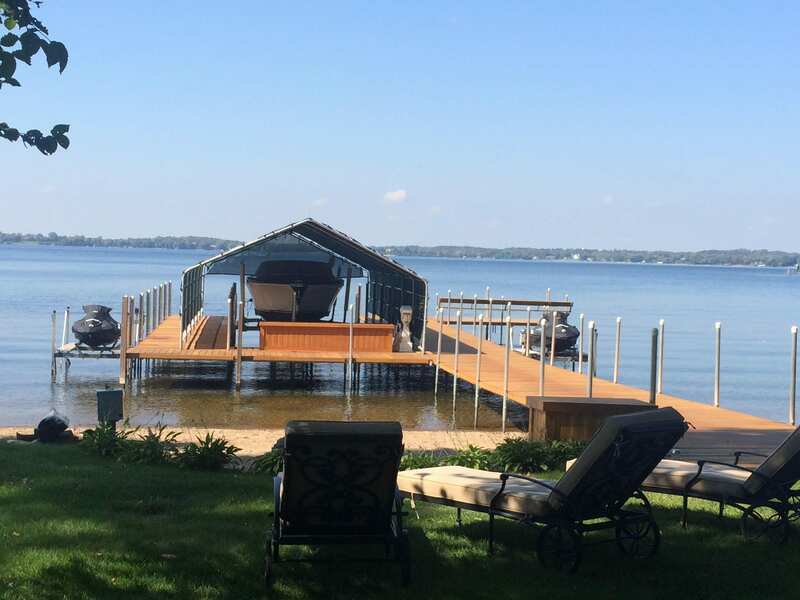 By eliminating the use of wood slats for vinyl support bridging, NICCUM Boathouses boast superior strength and a “cleaner” look than manufacturers who combine steel and wood. Because we use only steel bridging, our connecting brackets are custom milled to exact tolerances to provide a tight fit. Each boathouse framework is covered with a custom manufactured vinyl canopy top. 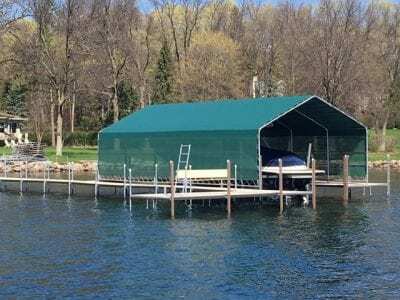 NICCUM Boathouses use the highest quality vinyl to resist fading and aging. Available in any color (standard color is hunter green), each top is manufactured using a 13oz. commercial grade vinyl. Our sales staff will make sure that your boat(s) fit perfectly. To create these canopies, five-foot sections of vinyl are heat welded together to provide a waterproof, seamless bond from one section to the next. The perimeter of each canopy is reinforced with 24oz synthetic inserts, which are triple wrapped, then sewn for maximum strength. Within the canopy’s perimeter, ¾” solid brass grommets are placed every 6 inches to allow the vinyl to be stretched over the steel framework to eliminate wrinkling and chafing. Depending on your specific needs, a NICCUM Boathouse may be equipped with integrated fenders. Contact us today at 763.682.4600. Each NICCUM Boathouse is custom built, whether your needs are large or small. 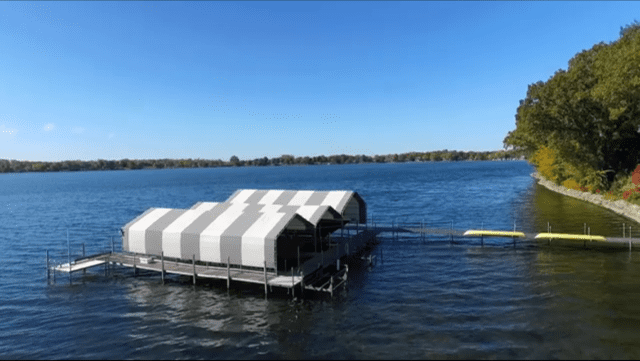 NICCUM Boathouses may be combined to provide multiple slips. Niccum boathouses may be combined to accommodate different boat sizes. Niccum Boathouses may be combined to share access from neighboring slips. Niccum Boathouses may be combined to have private slip access. 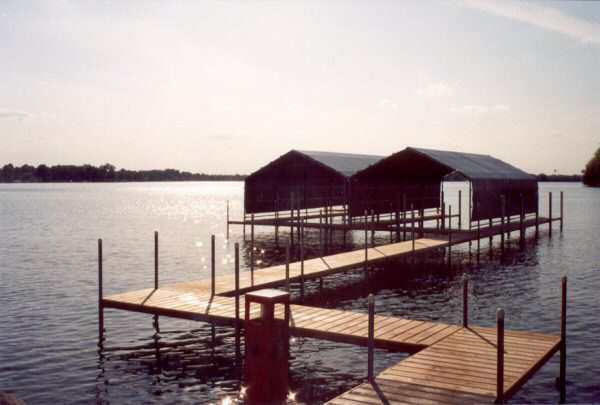 Niccum boathouses are available in all lengths, widths, and heights. 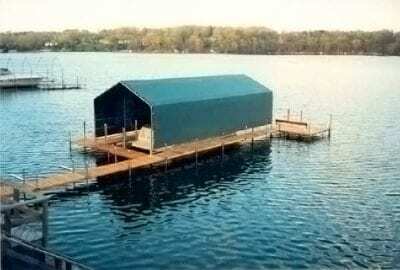 Niccum boathouses compatible with all walkway widths and all Niccum deck systems. Niccum Cedar Docks - an exclusive! Niccum Titan Docks - Maintenance Free!